Genomic technologies are transforming the Biomedical sciences. Recent developments in DNA sequencing are creating unprecedented opportunities in molecular diagnostics, personal medicine and (infectious) disease prevention. There is a clear need for genomics specialists that can analyse and interpret genome data in a (bio)medical context. Why study MSc Medical Genomics at Middlesex University? This is an interdisciplinary programme with teaching provided by Life Sciences and Computer Science research active academics as well as other experts in the field. You will gain a comprehensive understanding of how changes in the genome relate to human disease. You will be trained to pursue a career in medical genomics in academia and industry. This programme has a strong applied and practical focus. Hands-on learning provides you with the practical and computational skills needed for a successful career in medical genomics. What will you study on MSc Medical Genomics? This programme will provide you with a solid understanding of the structural complexity of genomes and how mis-regulation of genes can result in disease. In conjunction, specialist classes will provide you with practical skills in genome wide disease identification and molecular diagnostics via laboratory sessions. Computational tools and statistical techniques for genome research and diagnostics will be introduced using real-life data-sets and will specifically focus on computer coding, data handling and the analysis of large sequential data-sets. 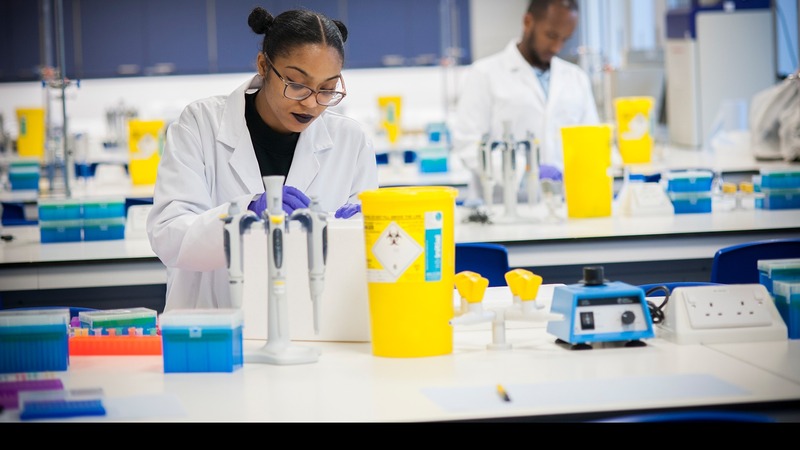 A strong link between research and teaching ensures you will develop good practical skills in medical genomics, preparing you for the job market. You will gain good laboratory skills in genomics, including sample handling and laboratory management. The programme also aims to teach good computing skills, including computer languages and the statistical analysis of big data. This will involve the design, planning of genomics experiments. The aim of this module is to provide you with the latest theory and practice of molecular diagnostics so you can gain a thorough understanding of the scope of molecular analysis technology used in the analysis and their use in diagnosis. The module aims to give you a thorough understanding on how evolutionary processes affect the genome and what can be concluded from such changes. The module aims to give you a detailed understanding of the structural complexity of genomes, their maintenance, and the intricate regulation of gene expression via molecular interactions and biochemical modifications. This module explores the ethical issues present in the rapidly developing area of genetic technology, including genetic testing and selection, genetic engineering, and the concept of genetic disease. How is the MSc Medical Genomics taught? This programme is taught through a mixture of lectures, seminars, computing workshops and investigative molecular and clinical laboratories. You are encouraged to actively engage with your learning. Group work is prominent in many modules and there will be opportunities to discuss and explore work with peers, academics and the technical team. Assessment is diverse and includes portfolio-work, writing a scientific paper, analysing genomic data, preparing a poster and presenting results. Additionally, you will submit a dissertation on your major research project and undertake a viva related to the work. The project will be supervised by a member of academic staff but you will be strongly encouraged to work with external partner institutions in the UK or overseas. In this case, you may also have a mentor based at the external institution. Dr Timmermans’ research aims to link the evolution and maintenance of biological diversity to changes in genomes. He uses genomic techniques to gain understanding of the genetics underlying phenotypic divergence.